Although I could singlehandedly stage an all-night Talkathon with the amount I have to say about my love for winter root vegetables, these balmy 60 degree days have got me seriously craving some springtime fare. 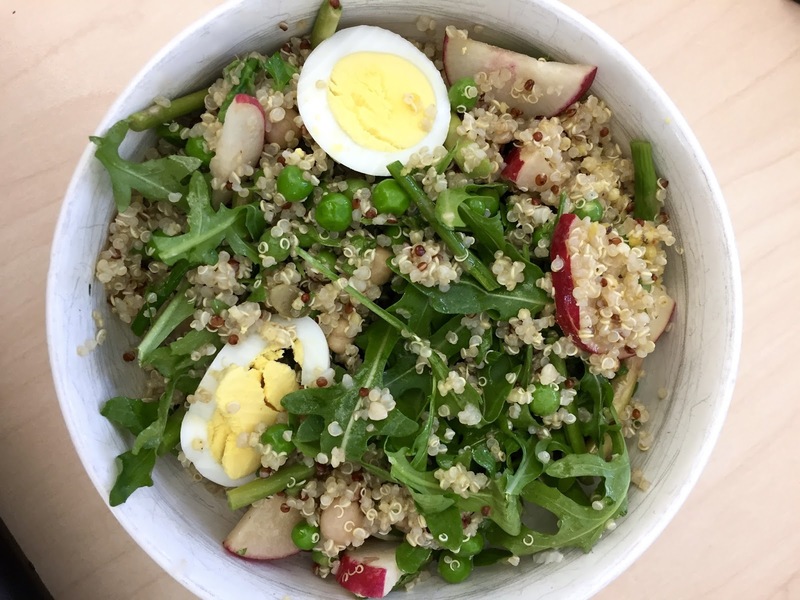 Signatures like peas, asparagus, and radishes won’t be available locally until the beginning of May, but this Spring Quinoa Bowl with Asparagus and Peas totally satisfies the yearning. (New mantra: if you can’t shop locally, shop for an ingredient list that can be exclusively filled at Trader Joe’s). Somewhere in between a salad and a grain bowl, this hearty dish showcases spring’s best produce offerings, plus a major protein boost from chickpeas and hard-boiled egg. Finished with a lemony-mustard vinaigrette, the bright, citrusy flavors create the perfect palate as we eagerly anticipate spring’s arrival. Lunch? Dinner? Likely both, as this verdant bowl begs to be doubled or tripled, a big-batch dish for sure. Substitutions are highly encouraged: swapping is the name of the game here. 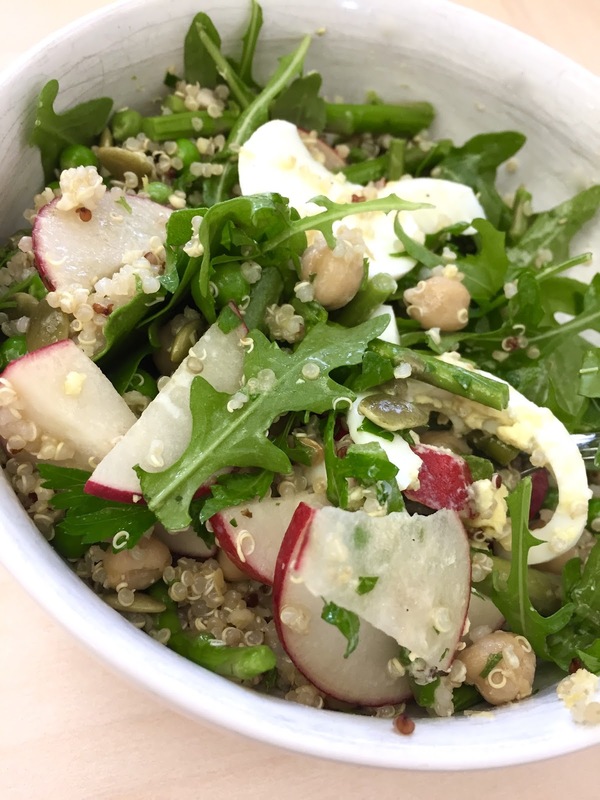 Sick of quinoa? Try farro or orzo instead. Craving something nutty? Forget pepitas, and garnish with chopped almonds or toasted pistachios. Looking for an alternate protein source? Try subbing feta cheese for chickpeas, or shrimp for the hard-boiled egg. Mint would go beautifully instead of parsley. And because I just presented you with a trendy, whole-ingredient grain bowl: yes, sliced avocado would be a lovely addition too. 1. Roast the asparagus. Preheat oven to 425 degrees Fahrenheit. Lay out a sheet of tin foil over a baking pan, and toss asparagus with 1 tsp olive oil, salt, and pepper. Bake until just tender, 12 to 15 minutes (less for thin spears). After they’ve cooled, chop spears into 1-inch pieces. 2. Cook the quinoa. Rinse quinoa thoroughly under cold water, then place in a small saucepan with 1 cup of water. Cover pot and bring to a boil, then simmer until liquid is absorbed, 15 to 20 minutes. Fluff with a fork. 3. Make the dressing. Combine the lemon zest and juice, vinegar, oil, mustard, honey, salt, and pepper together and whisk thoroughly. Adjust seasonings to taste. 4. Assemble the bowls, dividing the ingredients equally between the two. Start with placing the arugula in a wide, shallow bowl. 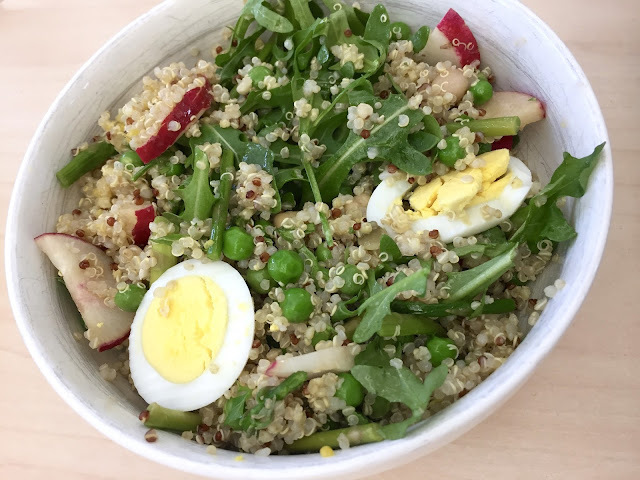 Top with half the quinoa, asparagus, peas, chickpeas, radishes, and egg. Drizzle the dressing. Top with pepitas and parsley before serving.